Ball heads swivel on a ball and socket joint. Release one control knob and the camera can point in any direction. They are fast to use and are preferred by wildlife photographers and any other photographer that wants to quickly change camera directions. Photographers that do several kinds of photography (landscape, still life, wildlife, portraits) often prefer ball heads for their speed and flexibility. For a heavy duty, top of the line ball head, I recommend the Really Right Stuff BH-55. Really Right Stuff sells directly to the public (see the link below) so you can’t by their ball heads at Amazon.com. Two more very good ball heads are the Kirk Enterprises BH-3 and Really Right Stuff BH-40. They are lighter and less expensive than the Really Right Stuff BH-55 but will do a very good job. The Kirk Enterprises BH-3 was my primary ball head for years. I bought a Really Right Stuff BH-55 this summer so the BH-3 is now my backup ball head. The Kirk Enterprises BH-3 (photo above) is currently my favorite lighter weight ball head due to the excellent construction and the Arca-Swiss style quick release system. Both heads will easily handle a DSLR with 70-200mm lenses, 100-300mm lenses, and some 100-400mm lenses. 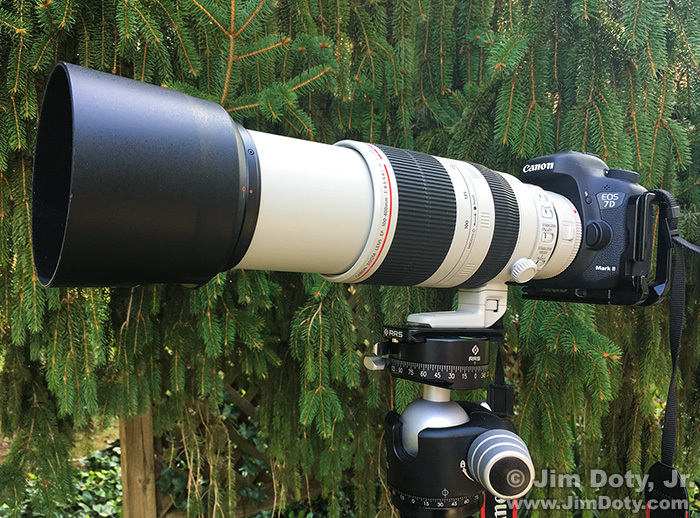 If you are using really big lenses like a 300mm f/2.8 or 400mm f/2.8 or larger, you will need to go to the larger Kirk enterprises BH-1 or Really Right Stuff BH-55. Kirk Enterprises and Really Right Stuff sell directly to the consumer via their web sites (links below). I use products from both companies. They both have excellent customer service and I recommend them highly. Kirk Enterprises also sells some of their products at Amazon. Both companies use the excellent Arca-Swiss quick release system. You buy a mounting plate or L-bracket that mounts to your specific camera model. The grooves in the bottom of the mounting plate or L-bracket fit into grooves in the tripod head. It is quick and very secure. Really Right Stuff BH-55 ball head holding a Canon DSLR, 100-400mm lens, and 1.4X teleconverter. There are also mounting plates made for specific telephoto lenses. There is a mounting plate on the tripod foot of this 100-400mm lens. The mounting plate drops into the Arca-Swiss jaws of the tripod head. 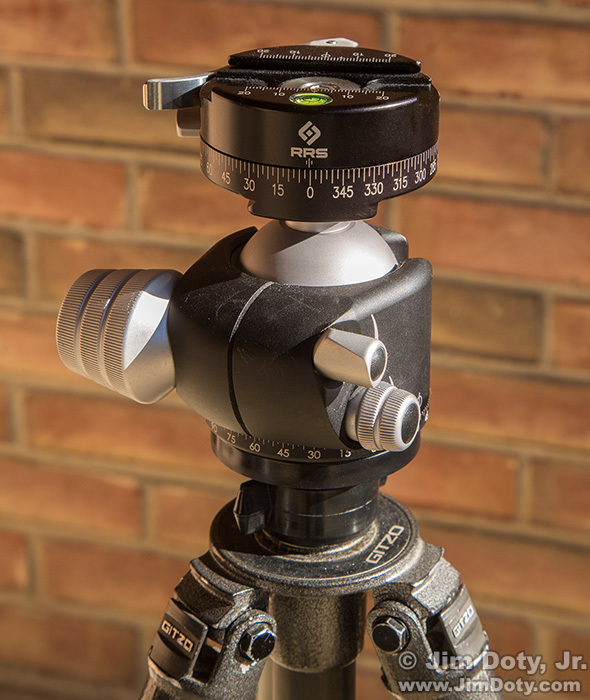 My favorite inexpensive ball head is the iOptron 3305A Sky Tracker Ball Head. Currently selling for around $60, it is as well made as tripod heads costing two or three times as much. It was designed to work with an iOptron Sky Tracker for astrophotography but it works just great by itself as an all purpose tripod head. It is Arca-Swiss compatible and comes with an adapter plate to go on the bottom of your camera. The iOptron ball head is the least expensive quality option for getting into the Arca-Swiss system. In between the top of the line models and the iOptron is the Induro BHL3S ball head. It is a well made alternative to the top of the line models. 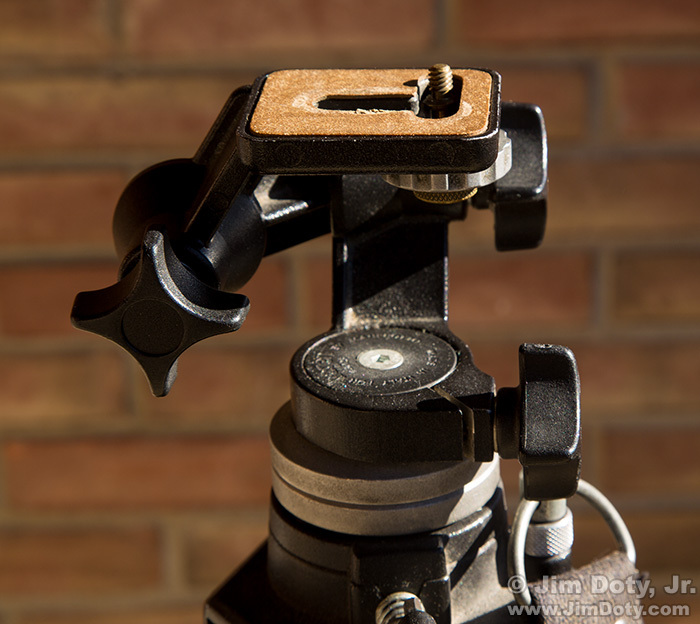 The Slik SBH-808DQ Ball Head head works well and costs about $80. I used one for a number of years before it finally began to wear out and slip which is when I moved up to the Kirk Enterprises BH-3. The Slik SBH-808DQ has a quick round quick release disc that screws on to the bottom of your camera or telephoto lens. Drop the disc into the top of the head, close the clamp and you are ready to go. It is quick and simple but not as good as the Arca-Swiss system. If you want Arca-Swiss, go with the iOptron, Induro, Kirk Enterprises or Really Right Stuff ball heads listed above. For the photographer on a tight budget, and if you like the Joby Gorillapod series, you can get one of the heavier duty ball heads like the Joby 5K. Just make sure you get a size that will handle the weight of your camera and heaviest lens. You can find Gorillapods in this section of my photography store. 3-way heads have three separate controls for camera movement in three different directions: left-right, up-down, and horizontal-vertical angle (and any angle in between horizontal and vertical). These heads are ideal for landscape, still life, and architectural photographers who want precise control and the ability to change the camera in one directional axis, but not the other two. They are slow to work with if you want to change the camera in 2 or 3 directions, but that usually isn’t a concern for landscape and still life photographers. . The current heavy duty model from Manfrotto is the MHXPRO-3W X-PRO 3-Way Head head which will hold up to 17 pounds of gear. For a lighter weight model get Manfrotto 056 3D Junior Camera Head or the prior model, the 3025 (if you can find one used). The Bogen/Manfrotto 3025 was my primary tripod head until I decided I needed to switch to the convenience of a ball head as I became more interested in wildlife photography. If you want the ultimate in 3-way control, get the Manfrotto 405 Pro Digital Geared Head. You can buy tripod heads from Kirk Enterprises, Manfrotto, Gitzo, Slik, and Joby in the tripod head section of my photography store which has direct links to Amazon.com with Amazon’s great prices, efficient ordering system and excellent return policy. My article on best of the best tripods. 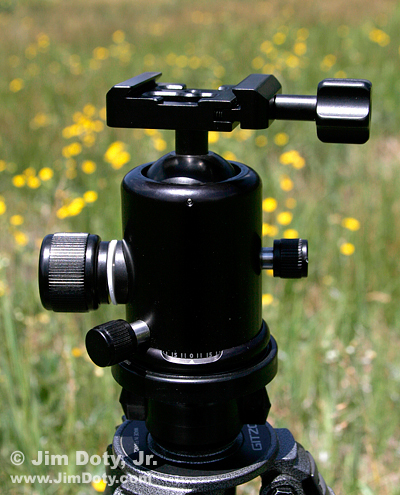 More information about the differences between various tripod heads is on this page at JimDoty.com. Information from Manfrotto tripod heads is here. Kirk Enterprises ballheads are here. Really Right Stuff ballheads are here.